(CNN) — Nancy Judd turns an orange rind into sequins. A can of Coke becomes shiny bangles. Plastic bags melt into chic crinkly fabric. What others call trash is her high fashion. Her newest creation is “The Environmental Steward-ess,” a 1940s air hostess suit sewn from leather seat covers donated by sponsor Delta Air Lines. Judd stitched the suit’s superhero cape from safety cards once found in seatback pockets. Her apparel is more for learning than wearing. After her cocktail dress made of vinyl Obama-Biden banners made it to the Inauguration, Judd declined a spot on “Project Runway.” She prefers grass-roots projects that she details on her website Recycle Runway. Her work has been displayed across the country at shopping malls, museums and airports. The latest installation of her “Recycle Runway” exhibit of 18 eco-trash garments will go up this week at Atlanta’s Hartsfield-Jackson International Airport. Judd recently spoke with CNN.com about her creative process. CNN: How did you start making recycled fashion? Judd: My mother owned a gallery and directed a college of art, and I spent my whole life in art classes. I loved to sew. In college, I got a degree in art and sociology. One year, my art school got a new pop machine. The garbage can next to it grew with all the pop cans. Seeing them thrown out just seemed wrong. I put a recycling bin next to the pop machine. I started wondering: Where does trash go? Who picks it up? After that, my career path was in solid waste and recycling. As the recycling coordinator for Santa Fe, to promote a weekend-long exhibit of recycled art, I threw together a little outfit made of bubble wrap. Each year, I made another dress, getting more and more intricate. Now, I can’t imagine using anything but trash. If somebody gave me a $200-a-yard fabric, I would be at a loss. 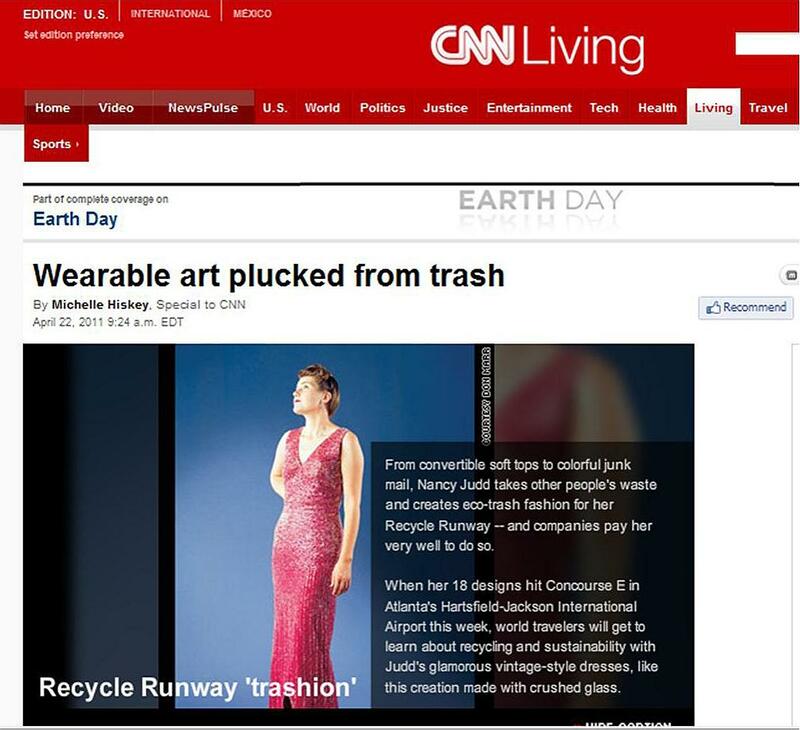 CNN: Besides the landfill, where does your art come from — the vision? Judd: Honestly, it feels like divine intervention. Artistically, I have a sense of confidence that doesn’t really line up with the rest of myself. I don’t know why I can say to Delta or Toyota, “Send me your waste and I will create something I know you will love.” All I can say is that my art comes from a spiritual, creative relationship that is so interesting to me. CNN: Do you have a favorite piece? Judd: That’s like picking a favorite child. The Eco-Dress really pulls together everything. 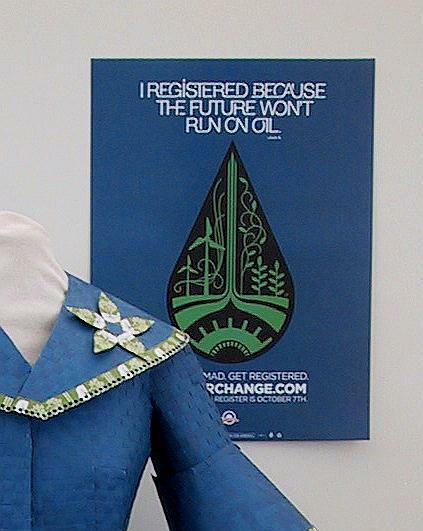 It’s a Scarlett O’Hara-style dress made of [scrap paper] pledges written by 2,000 children across the country. Having people involved really feeds the mission of what I’m doing. CNN: Do you use a special sewing machine? Judd: I use a regular one from my sponsor Janome. I’ve sewn inner tube tires fine, and the soft top of a Toyota convertible. CNN: Explain how the stewardess cape of safety cards only looks cheery. Judd: The cards are really colorful, really whimsical. I researched the super-heroine Wonder Woman, created in the 1940s — the same era this type of suit was worn by Delta stewardesses — by a psychologist to provide a strong role model for young girls. In addition to her invisible plane and bulletproof bracelet, Wonder Woman was given a lasso of truth that made men be honest. This garment is about being a role model who is strong and stands up for the environment. The safety cards are scenes of people preparing for a crash. The cards ask, “What if?” That sort of emergency is happening around the world with the environment, because of our decisions. My art is about what we can do in our lives to live lighter on the Earth, and to prepare ourselves. Like the safety cards, the message is about conservation and preparation. CNN: What details are less obvious? Judd: The cape looks windblown because of the wire armature holding it up, made from yard signs from the Obama campaign. CNN: How much do you charge for a commission, and who pays? Judd: About $10,000. A dress will take anywhere from 150 to 450 hours to make. The contract allows me to keep the dress for future exhibitions. I only work with organizations that are doing something substantial for the environment. One of my sponsors, Coca-Cola, is creating bottles that are plant-based and has started the first bottle-to-bottle recycling plant! CNN: What are some of the environmental hazards of creating eco-conscious art? Judd: I only iron plastic outside. I wear a heavy-duty respirator mask around chemicals and when I drill metals. CNN: Is your tetanus shot current? Judd: It should be, but I don’t think it is. CNN: What size are your dresses? Judd: For a while, I made all my pieces about a size 12, because honestly, I was the only available model. CNN: Describe a future piece. Judd: The Biodegradable Dress starts with cheesecloth — a lot of people in Santa Fe make their own cheese. Attached are sequins in a turn-of-the-century pattern. The sequins are being made in public workshops from oranges and tangerines. After eating, people punch peels into small circles and dry the circles on a pin. This dress will be sturdy enough to last 100 years. Throw it on a compost pile, and it could disappear in a month. Michelle Hiskey writes occasionally about the creative process for CNN.com.